Love decorates the mood every February 14 and the Valentine's Day decorations speak the heart for you ! So all you have to do this Valentine's Day is to make the ambiance irresistibly romantic and set the decorations warm, snug and love-ly. Whether it be a Valentine's Day party or just a cozy dinner date with your beloved, the Valentine's Day decorations are not to be ignored. The decorations, of course, help you get into the feel of the day and set the ball rolling. Valentine's Day decorations can be done with flowers, ribbons, candies or just with paper and cloth. No matter which way you do it, the decorations for Valentine's Day should just be perfect and help set the stage for a memorable celebration. So if you need a little help on how to kick off the Valentine's Day decorations, read on. The first thing that should be kept in mind before laying your hands on Valentine's Day decorations is that red or shades of red is the color to go for. So make sure you have lots of red, crimson or pink around. The flowers, curtains, bed-spreads, table-spreads, carpets, balloons, and even cutlery and other decorative pieces can be in red just because it's Valentine's Day. With so much of red around, all the blues are sure to disappear soon only to leave you with a rosy feeling of love, luck and joy ! 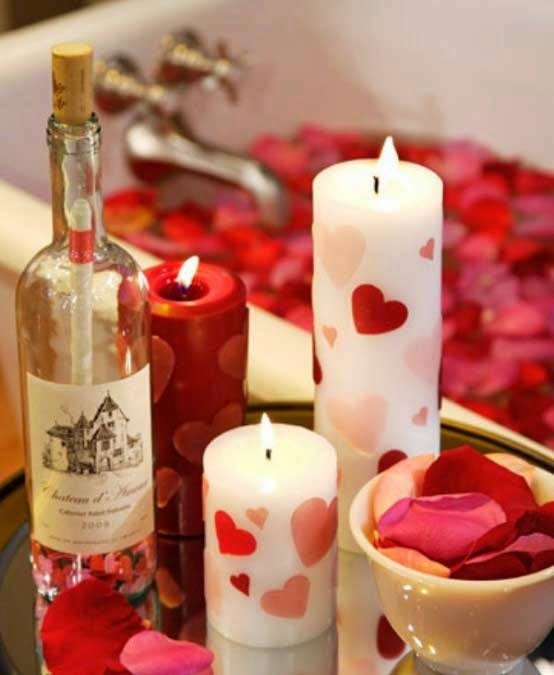 Now for some romance and mystery--fill water into big glass bowls and float a few heart shaped candles in them. You can also strew rose petals around the candles to couple up the warm glow of the candles with the sweet aroma of roses. These make wonderful Valentine's Day decorations if placed on the centre table or next to the bed or better still on the dinner table. Now if you are a little tight on budget, then this Valentine's Day decoration idea is just the thing for you. Many flowers are damaged while shipping and florists often sell the petals at really low rates. So you can buy lots of these petals and leave them carelessly around the home--maybe near the bath tub or at the doorway. Or you can just make a trail from the door to the bedroom for your valentine to walk on when he/ she returns home. Isn't that good for a simple and affordable Valentine's Day decoration? At the Valentine's Day party, arrange for red punch and pink lemonade. Food sure add to your Valentine's Day decorations, don't they ? So check out how the menu adds a facelift to the décor of the day--have a few heart-shaped cookies, candies, pizzas, sandwiches and of course that big, heart shaped chocolate cake. Now decorate the dinner table with a red table cloth and have silver tableware placed on it to enhance the look. To take it a step forward, make sure you dump a lot of petals and heart-shaped red confetti around the plates, on the entire table. You can also stick heart shaped little cutouts on the red table-cloth to give a personalized touch to your Valentine's Day decoration. Any party decoration is incomplete without balloons, ribbons and streamers. Same holds true for Valentine's Day decorations. So do get loads of those chic streamers, balloons and red ribbons on February 14. Try to get many heart shaped balloons and hang them from the ceiling. Interlace the balloons with streamers and have a totally dressed up room on Valentine's Day ! And when talking about Valentine's Day decorations, how can one leave out the flowers ? Yes, flowers make for the prettiest decorations on any occasion and so are a favorite with most people. Since it's Valentine's Day, roses should top the charts, but you can also deck up your room with other bright flowers with a perceptibly nice fragrance such as hydrangeas and hyacinths. Here come the candies now. Candies are the most coveted items on the Valentine's Day list for sure. And so include them in your Valentine's Day decorations as well. Take long wine glasses and stuff them with assorted candies and place them on the centre table. Not only will it add a dash of color to the room, but it will also keep the theme of sensuality going. Now if you have a child at home, dress him/ her up as cupid. Ask your guests to come early, before the bed time of the child. Make the kid greet the guests with a miniature bow and arrow. Not only will this be the cutest piece of Valentine's Day decoration, it'll also make the child feel special and involved. Gift baskets make good centerpieces too. And at the end of the party, give out the gifts from the basket as party favors. Make the basket attractive by adding lots of Valentine's Day goodies like candies, teddies, fruit cakes, etc. 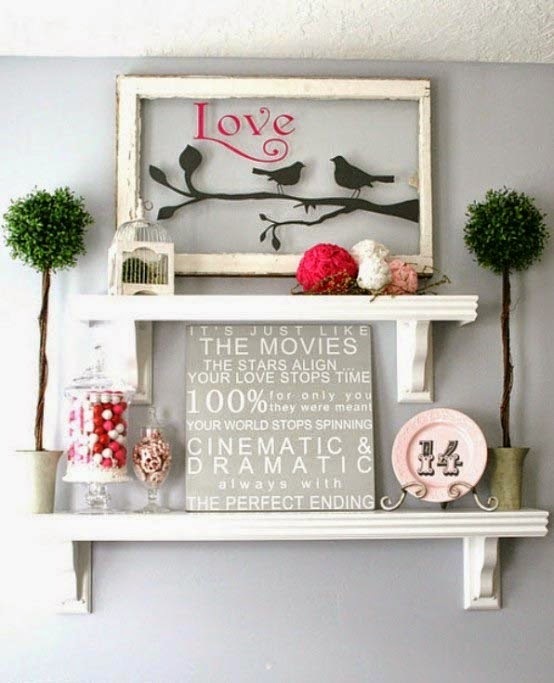 Cover it with ribbons and confetti and transform it into a beautiful Valentine's Day decoration. 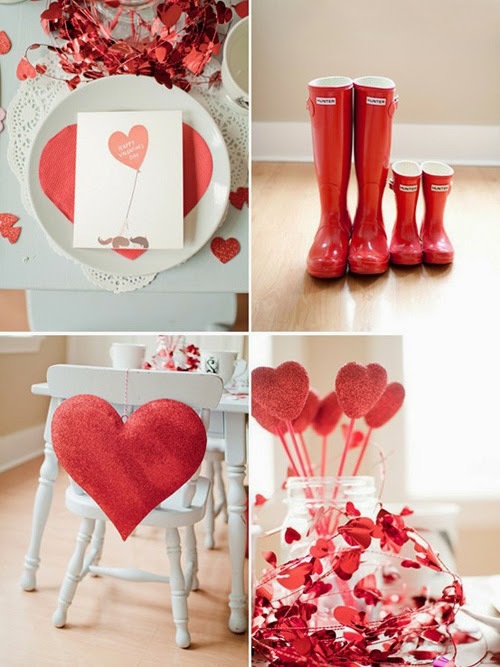 Deck up your house this February 14 and have a dreamy Valentine's Day ! Let the decorations do the talking for you. Try out these Valentine's Day decorations and romance up your house. And you can combine these decorations with your own decorations and wait for the accolades to flow in ! Just enjoy the beauty around and feel beautiful inside with your loved ones by your side.